The first retroactive Warhol exhibit organized by a U.S. institution since 1989, according to the Whitney’s website, is a celebration of everything Warhol. The focus on consumerism, the Cold War and pop culture draws stark parallels with the culture and politics of today — but there’s an element of chaos that wreaks havoc on any semblance of order a visitor might try to hold in mind. 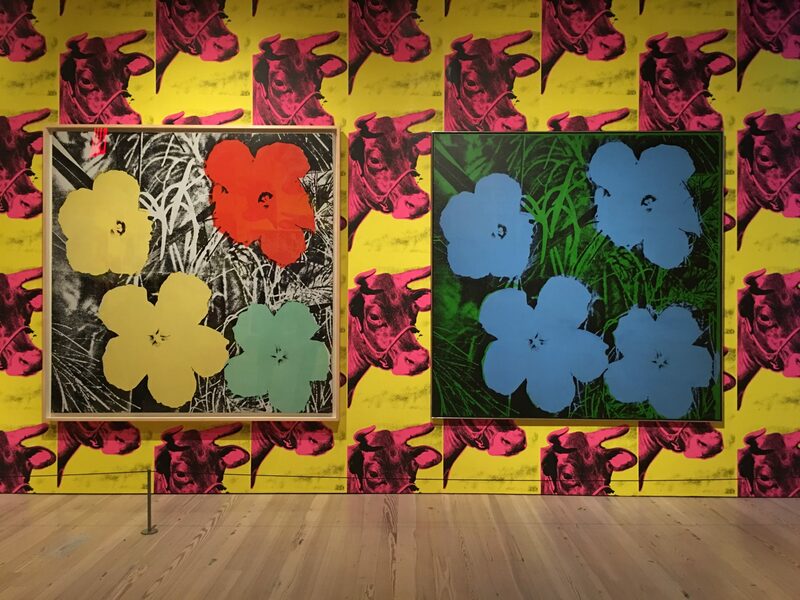 Immediately to the left of the elevators, a hallway with walls printed in loud yellow with bubblegum pink cows leads to a room with Warhol’s 1964 series of “Flowers” paintings. A woman mused that the walls would look nice in her living room (sarcastically or not, I don’t know). Though today’s exhibition designers did Warhol justice by acknowledging the print — Warhol enjoyed his cows so much that he papered his entire 1971 Whitney exhibit with them — they did our eyes justice by containing it to one room. The remainder of the floor — entirely devoted to Warhol — managed to keep its sense of whimsy without the obnoxiously painted walls. Warhol’s work was up, down, wherever you looked. Entering his Death and Disaster series, it would be easy to miss the tiny “Flowers” rendition hanging randomly on the wall, high enough that it could only be seen by accident. The “Death and Disaster” series itself was appropriately set apart from Warhol’s other work considering its shift in tone. Though all of Warhol’s work holds a hint of the sardonic, this exhibit especially hangs a shadow over viewers with its dark humor. Visitors entering the room stop where they are, some sitting to stare while others stand in place, as they’re lambasted in every direction by pictures of bodies and news articles that paint tragedy over and over and over. With the news now dominating both conversation and social media, it’s a curt nod to the blasting foothold the industry still holds in our lives. Other areas of the exhibit give their own nod to American politics. A significant portion heavily focuses on Warhol’s massive portrait that pokes fun at Chairman Mao, created to mark President Nixon’s visit to China — a country considered a national enemy at the time. Another wall is painted with bright renditions of his preliminary sketches, overseeing a display case holding his work that led up to the caricature. The focus mirrors the current relationship between the two countries; they’re practically simmering intentions as they sink into a new cold war of their own. Despite the technological leaps and bounds the world has made since the decades of Warhol’s prime, his work is still a revelation of social and political irony. Through the chaos of the exhibition, the Whitney manages to offer samples of each element of his work and stay true to the artist, even as it brings in elements of the modern-day.